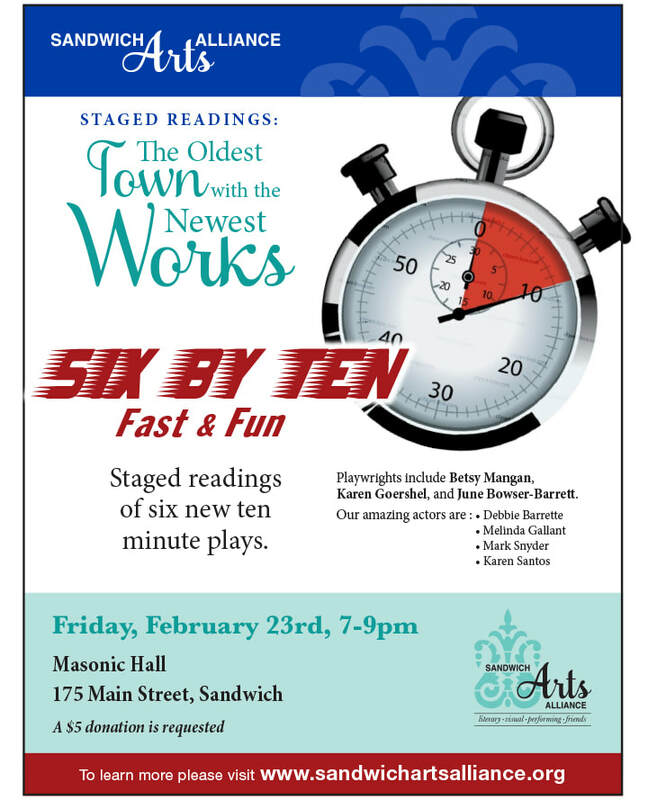 "The oldest town with the newest plays” has been an ongoing goal the Sandwich Art’s Alliance continues to fulfill this Friday with six new works by local and area writers and actors in “Six by Ten: Fast and Fun -Staged Readings. The six plays were chosen from more than thirty submissions by the Staged Reading Committee of Sandwich Arts Alliance and the overall criteria for choosing these pieces were their entertainment value and “fun factor” for the audience. Local playwrights Betsy Mangan, June Bowser-Barrett, and Karen Goershel are joined by Boston Playwrights’ Platform members Patti Cassidy, Margie Semilof, and Ron Radice. Actors include Debbie Barrette, Melinda Gallant, Bud Hammond, Karen Santos, Mark Snyder, Rick Sharp, and Diane Scharf.